The member of the Hispania pit crew who was injured at the Italian Grand Prix on 12 September will soon leave hospital and return home to Germany. 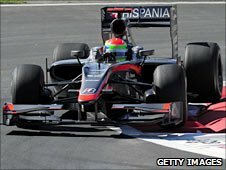 Sakon Yamamoto was fined $20,000 (£12,900) after his car hit the man on the head during a pit-stop, leading to the engineer being taken to hospital. Hispania announced the injured engineer "is recovering positively". "He is supposed to leave the hospital in Italy soon and go back to Germany, his home country," the team added.